Today, as urban living becomes ever more the norm and digital interactions replaces face-to-face, personal interactions, children are becoming distanced from nature as well as their immediate social surroundings. Outdoor school, an increasingly widespread trend, is a response to such change. More and more studies are focusing on different ways that outdoor education enriches students performance, experience, and learning capacity and encourages them to be more engaged in the learning process. 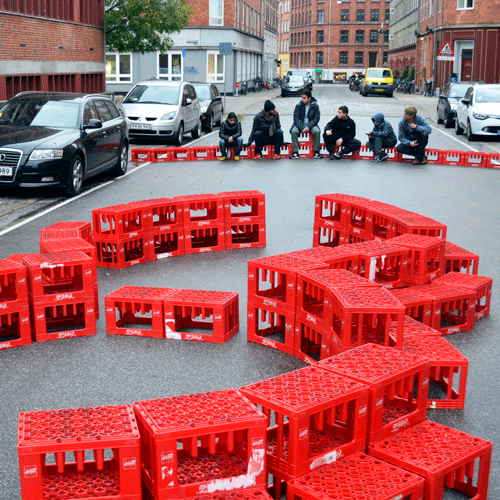 In line with this development, arki_lab is carrying out an action-based project in Nørrebro to investigate potential solutions for multifunctional urban spaces as well as different outdoor classroom scenarios that could take place in an urban setting. This project will be done in collaboration with Nørrebro area Renewal (Områdefornyelse Nørrebro) and BUF (Children and Youth Committee) and is consisted of a series of workshop with students and teachers from Blågård School and Nørrebro Park School. The workshops aim at gathering knowledge, ideas and feedback from the participants about the existing forms of outdoor schools, as well as develop new types that is in harmony with the district and the users’ needs. The workshops cover different activities, including social and spatial analysis of the area and the ways it could support outdoor education, exploring other outdoor school projects through excursion, and testing out various outdoor classroom scenarios through prototyping. Last but not least, all the ideas and knowledge gathered throughout the process will be shared with the teachers, to get their feedback and input. This project will serve as a learning process for both its organisers and participants. While participants learn about different types of outdoor learning and the richness of their immediate surrounding as a learning platform, the organisers gain local knowledge that enables them to co-design the most effective outdoor school scenarios and spaces. Furthermore, it would hopefully generate political will and intereste to support outdoor school projects. The project will be kickstarted in March 2017.